At British American Tobacco (BAT), we have a long and proud 100-year history in agriculture, working directly with farmers around the world and advancing sustainable practices. While this undoubtedly brings advantages to our business in terms of securing our source of high-quality tobacco leaf, it also plays a significant role in protecting the environment and enhancing farmer livelihoods. Through our global Leaf Research & Development (R&D), we develop new and innovative sustainable farming technologies, techniques and best practice, which are rolled out to farmers as part of comprehensive agri-support packages. 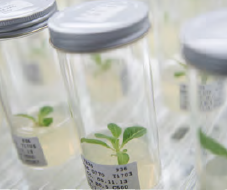 Our Leaf R&D was first formed in Rio de Janeiro in 1974 and focuses exclusively on new ideas and ways of doing things that can be deployed to support our tobacco growing sources worldwide. It includes state-of-the-art scientific research labs, plant breeding facilities, and partnerships with highly respected academic and research institutions. Defining: What technologies and techniques are needed to address particular issues or needs, such as more efficient crop irrigation in areas where water is scarce. Discovering: What new research needs to be undertaken, and what techniques can be adapted from other crops. Developing: Conducting scientific research to develop new techniques and technologies, and testing and validating them through field trials. Deploying: New techniques are adapted into comprehensive, locally relevant, agri-support packages, to be rolled out by our Extension Services to farmers worldwide. Our global network of expert field technicians plays an active and important role in rural communities, acting as a direct link between over 90,000 farmers and BAT. Field technicians visit the farms at every stage of the growing cycle, building trusted relationships and gaining unique insights into the challenges our farmers face, as well as wider sustainability issues affecting the local community or landscape. These insights enable us to tailor our Extension Services and sustainability programmes to meet real needs and circumstances on the ground. 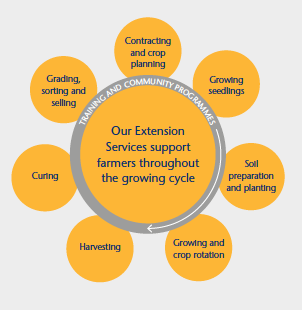 Our third-party suppliers also use a similar Extension Services model to provide guidance, technical assistance and capacity building for the 260,000+ farmers they contract. By supporting farmers in this way, we can help them maximise the potential of their farms and enhance the livelihoods and resilience of rural communities. They and future generations are then more likely to feel motivated to remain in agriculture, look after the environment, and see the value of growing tobacco as part of a diverse range of crops. Learn more in BAT’s Sustainable Agriculture & Farmer Livelihoods Focus Report which can be downloaded here.